I had an occasion recently when it would have been really helpful to know that a new address added to the database was a duplicate of an older, inactivated address. The addition wasn’t identified as a duplicate because it wasn’t a perfect match — a difference similar to that between 13 Anywhere Road and 13 Anywhere Drive. After the fact, I did a Google search and discovered some easy-to-use functionality in Oracle SQL that might have saved us some trouble. Today I want to talk about how to use UTL_MATCH and suggest some cool applications for it in Advancement data work. “Fuzzy matching” is the term used for identifying pairs of character strings that may not be exactly the same, but are so close that they could be. For example, “Washignton” is one small typo away from “Washington,” but the equivalence is very difficult to detect by any means other than an alert pair of human eyes scanning a sorted list. When the variation occurs at the beginning of a string — “Unit 3, 13 Elm St.” instead of “Apmt 3, 13 Elm St.” — then even a sorted list is of no use. According to this page, the UTL_MATCH package was introduced in Oracle 10g Release 2, but first documented and supported in Oracle 11g Release 2. The package includes two functions for testing the level of similarity or difference between strings. Like EDIT_DISTANCE, it has a related function called JARO_WINKLER_SIMILARITY. Again, this ranges from 0 (no match) to 100 (perfect match). This is the function I will refer to for the rest of this post. Someone named “Donald MacDonald” would get a fairly high value for JW, while “Kevin MacDonell” would score much lower. “Thomas Thomas” would score a perfect 100. Let’s turn to a more useful case: Finding potential duplicate persons in your database. This entails comparing a person’s full name with the full name of everyone else in the database. To do that, you’ll need a self-join. In the example below, I join the “persons” table to itself. I concatenate first_name and last_name to make a single string for the purpose of matching. In the join conditions, I exclude records that have the same ID, and select records that are a close or perfect match (according to Jaro-Winkler). To do this, I set the match level at some arbitrary high level, in this case greater than or equal to 98. Detecting duplicate records via address matching. Screening current and incoming students against prospect, donor, and alumni records for likely matches (on address primarily, then perhaps also last name). Data integrity audits. An example: If the postal code or ZIP is the same, but the city name is similar (but not perfectly similar), then there may be an error in the spelling or capitalization of the city name. Searches on a particular name. If the user isn’t sure about spelling, this might be one way to get suggestions back that are similar to the guessed spelling. Now back to reality … When you run the two code examples above, you will probably find that the first executes relatively quickly, while the second takes a very long time or fails to execute at all. That is due to the fact that you’re evaluating each record in the database against every other record. This is what’s known as a cross-join or Cartesian product — a very costly join which is rarely used. If you try to search for matches across 100,000 records, that’s 10 billion evaluations! The length of the strings themselves contributes to the complexity, and therefore the runtime, of each evaluation — but the real issue is the 10,000,000,000 operations. As intriguing as UTL_MATCH is, then, its usage will cause performance issues. I am still in the early days of playing with this, but here are a few things I’ve learned about avoiding problems while using UTL_MATCH. Limit matching records. Trying to compare the entire database with itself is going to get you in trouble. Limit the number of records retrieved for comparison. A query searching for duplicates might focus solely on the records that have been added or modified in the past day or two, for example. Even so, those few records have to be checked against all existing records, so it’s still a big job — consider not checking against records that are marked deceased, that are non-person entities, and so on. Anything to cut down on the number of evaluations the database has to perform. Keep strings short. Matching works best when working with short strings. Give some thought to what you really want to match on. When comparing address records, it might make sense to limit the comparison to Street Line 1 only, not an entire address string which could be quite lengthy. Pre-screen for perfect matches: A Jaro-Winkler similarity of 100 means that two strings are exactly equal. I haven’t tested this, but I’m guessing that checking for A = B is a lot faster than calculating the JW similarity between A and B. It might make sense to have one query to audit for perfect matches (without the use of UTL_MATCH) and exclude those records from a second query that audits for JW similarities that are high but less than a perfect 100. Keep match queries simple. Don’t ask for fields other than ID and the fields you’re trying to match on. Yes, it does make sense to bring down birthdate and additional address information so that the user can decide if a probable match is a true duplicate or not, but keep that part of the query separate from the match itself. You can do this by putting the match in a WITH clause, and then left-joining additional data to the results of that clause. Truth be told, I have not yet written a query that does something useful while still executing in a reasonable amount of time, simply due to the sheer number of comparisons being made. I haven’t given up on SQL, but it could be that duplicate detection is better accomplished via a purpose-built script running on a standalone computer that is not making demands on an overburdened database or warehouse (aside from the initial pull of raw data for analysis). The best I’ve done so far is a query that selects address records that were recently modified and matches them against other records in the database. Before it applies Jaro-Winkler, the query severely limits the data by pairing up IDs that have name strings and address strings that are nearly the same number of characters long. The query has generated a few records to investigate and, if necessary, de-dupe — but it takes more than an hour and half to run. Have any additional tips for making use of UTL_MATCH? I’d love to hear and share. Email me at kevin.macdonell@gmail.com. Figuring out connections is a big part of major gift fundraising. A development office might have a great list of prospective donors in hand, but those prospects will languish untouched if the right people who can make introductions are never found. While cultivating relationships with well-connected people is clearly important, research also plays a role in suggesting possible go-betweens. And to the extent that research involves sifting through data to find connections, it’s possible to automate some of the work. Wouldn’t it be great to have software that asks you to name a prospective donor, and then spits out a list of people in your database who are most likely to be associates of that person? Sure it would! Social media applications do a version of this, suggesting “people you may know,” based on shared connections and attributes such as schools attended, professional group memberships, employment information, and stated interests. I first encountered a higher-ed advancement application of this concept via Erich Preisendorfer of the University of New Hampshire. A while back, Erich explained his approach in a guest post for CoolData. (Read it here: Finding connections to your major gift prospects in your data.) I was recently in touch with Erich and he reports that the tool is still in use by prospect researchers at UNH and is still turning up valuable connections. I tried to build something similar using our reporting tools, but it was a slow-lumbering beast, and not very user-friendly for the people most likely to be interesting in using it — prospect researchers, mainly. I never gave up on the idea of building something better, and finally on a quiet weekend a few months ago, I found two or three hours to mess around with a Python script. Given the ID of a person, this script makes multiple queries of the database and joins the results together to produce a ranked list of other people who might be associated with the input ID. It takes the ID provided by the user and queries the database to display the name associated with that ID (that would be me, in this example). It checks to see what events I attended, and produces a list (in memory) of all the IDs of constituents who attended those same events. It checks to see what activity codes I have attached to my record — varsity sports teams, student clubs and so on. I have none, but if I did, the script would return a list of all the people who shared the same activity codes. Again, this is saved in memory for use later on. The same routine is followed for employers (past and present), all class years, degrees, referring high school, cities extracted from mailing addresses (again, all past and present addresses), age, and database cross-references. All of these lists are combined into a single “object” in memory. The number of instances of each distinct ID is counted up. Every ID retrieved is a “hit”. The idea is, the more hits for any one retrieved ID, the more likely that ID belongs to someone who knows me (or knows the person who we are searching on). Because the resulting list is huge (more than 31,000 records just for me — and I have very little data attached to my record), the script asks the user to limit by a minimum number of hits. I’ve entered 3 here. The result is a file with 47 IDs. The script then does a final query on the database to retrieve the names and other details for these people, and saves the results as a .csv file that can be opened in Excel. Here are the top few rows of the output. I have removed some columns for simplicity, and blanked out some personal information. The count_sum column is the “hit count”, and the list is sorted in descending order by count_sum. The person being searched on is always at the top of the list. This is not an especially impressive example, because I am not an alumnus. My list of likely connections is made up of co-workers and people from my hometown who happen to be the same age as me. The woman in the third row of the data was someone I had a crush on in junior high school but haven’t seen in 27 years … If I were a prospective donor, this search would be a bust. Clearly this method requires quality alumni data in order to be useful. That’s how it functions. We will dig into the actual code shortly. But first, let me say that my primary aim is to share this with you as an idea. I can’t help you with installing Python or debugging or any of that. All I can do is show you my code and hope you can modify it to make it work for you. If you think this is cool and useful but don’t want to learn any code, I suggest you team up with someone from IT or your Advancement Services team, or a student or prof in the Computing Science department. As I said, I’m using Python and a code library for handling data called pandas. (For some background, see my earlier posts: Getting bitten by Python and Automate RFM scoring of your donors with this Python script.) The great thing about pandas is that you can load data into in-memory structures called DataFrames, which are like data tables in that you can perform joins and sort, rank, de-dupe, add calculated columns, and so on. Erich at UNH goes the extra step of matching on date range along with employer. I think a shared corporate connection is worth a point, but being at the same place of employment at the same time is obviously worth a lot more. If you have other ideas for things to match on, I’d love to hear them. Those of you who aren’t into Python but know SQL can probably make an all-SQL version of this. I just like Python. In the code, I have inserted comments to help guide you through. Everything to the right of a “#” is a comment. The script includes multiple individual queries. You may wish to lump them together using UNION ALL, appending all the results sets together right in the body of the SQL. Up to you. The queries that pull records based on shared events, degrees and so on all have the same basic structure: First, a WITH clause gathers the codes for the events (or degrees or cities) that the target ID has attached to his or her record, then a SELECT statement finds all the other IDs who have those same codes attached to their records. 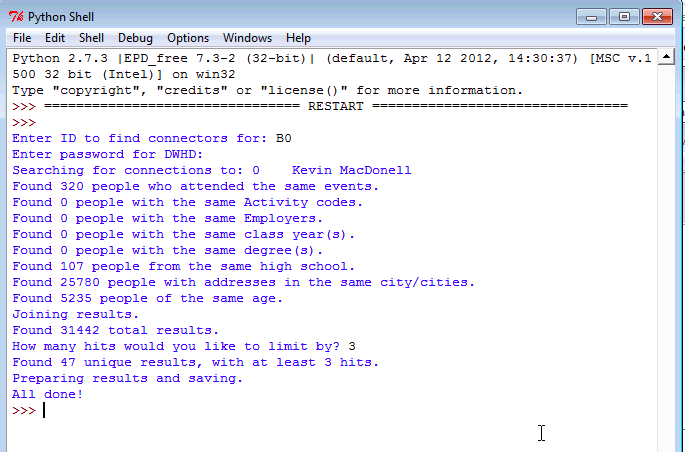 In order to break the SQL up into multiple lines, I have enclosed the string between groups of three single quotes. You’ll see that whenever I have to insert a variable into the SQL (such as ‘target_pidm’), I have to use what looks like a confusing jumble of single and double quotes — but the ordering is very precise. I was going to simplify the SQL for you, but didn’t see the point. One way or the other, you will still have to modify it. So it’s much the same as what I actually use. You’ll also notice that I tend not to use aliases for tables and views, which makes the queries text-heavy. Sorry. One limitation of this tool is that it will run only on a machine that has a Python installation. For that reason I haven’t been able to simply give it to someone (in Prospect Research, say) and have them run it themselves. The next step might be bundling it as a stand-alone executable file (an .exe) that could be shared with others, but I haven’t gotten that to work yet. AND, one final, final comment: This is probably the last piece on Python and database querying I’m going to write for a while. In future posts I will tone down the technical stuff and get back to talking about data and predictive modelling. # Query to get the database PIDM and name for the entered ID. target_pidm = max(df['PIDM'])    # PIDM, not ID, is the primary key in my database. # Group by PIDM and sum on ‘count’ to get ‘hits per PIDM’. # De-dupe rows in order to get one result per PIDM. # Sort results in descending order by the number of hits. # The file is potentially huge, so prompt the user to limit it by hit count. # Keep rows with minimum number of hits. # Get rid of the ‘count’ column - not needed. In my last post I described how to automate RFM scoring using the scripting language Python and pandas. Automating RFM scoring is a great way to learn a bit of Python — but on its own it’s a lousy reason for learning Python. It was pointed out to me that you don’t really need to call on the power of Python if you’re already comfortable with (or learning to use) SQL, and I agree. Shortly after publishing the Python post, I got an email from Bruce Higgins, who works in the Alumni Affairs & Development office at Cornell University. His all-SQL solution is shown below. I leave it to readers to figure out how to make it work for them. In the wake of my post there was some great discussion and code-sharing on the Prospect-DMM discussion list, and I encourage you to look up that thread. You’ll notice that Bruce has hard-coded the dollar values used for scoring “Monetary value” instead of dynamically dividing the file into quintiles. As he points out, if you’re scoring the same database over and over, it’s not likely these dollar thresholds are going to change much over time. You will of course need to make adjustments for your own donor data.